It is great experience to fly Remote Controlled (RC) Helicopter for kids and adults. It comes in different types (Drone & heli), shape, and size with remote. Its lightweight design with powerful inbuilt rechargeable battery makes suitable for both indoor and outdoor play. Its controls are easy to understand but little bit difficult for novice flyers. Mostly controls on Heli and remote unit are similar with different models except few, makes easy to learn. (c) Indicator: Indicate Operation/Charging mode. (d) Charging Socket: to recharge battery inside the Heli. Charger can be for charging, but if some For which special charger is supplied with Heli. If may not be supplied with Heli. Mobile charger can be used for the same. 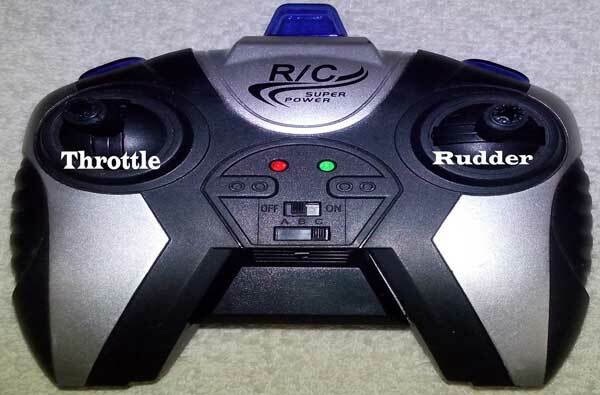 (c) Rudder: Controls forward/back movement and turning to left/right. (d) Trim: left/right drift control. (e) Channel Switch (A, B, C): Select one of it as per model. (f) Cell housing under side of the remote. 3. Charging of RC-Helicopter - RC-Helicopter is equipped with inbuilt powerful rechargeable battery which is at least enough for 15-20 min of flying. A USB charging point is present at Helicopter outer body. (a) Charge either with handset charger or through USB cable of computer. Mobile set chargers also do the job. (b) While charging ensure Helicopter ON/OFF Switch is at OFF position and red light near USB charging point is OFF. If red light stays ON, switch the Helicopter ON and OFF few times whilst plugged in. (c) While charging white indicator below front nose should blink and red indicator at USB point should remains OFF. (d) Charge at least for 30 min (45 min full charge). (a) Ensure Helicopter is fully charged. (b) Put AA Batteries (Pencil Size) in remote slots and screw the cover back. (c) Put Helicopter ON, check LED lights are flashing. (d) Place it on a flat surface before flying. (e) Turn the remote ON. Slide channel position to ‘A’. Wait for 5 seconds. Flick the left Joystick (Throttle) up and down twice. Wait further for 5 seconds and flick the Joystick again. Rotor should come on. If rotor remains static then change cannel position to ‘B’ and then flick the Joystick. (f) Your helicopter is ready to take-off now. (g) When flying for first time, practice for slow lift of helicopter with Throttle stick and back to ground. Then practice for forward-back then left-right. (a) Never be overconfidence, this could damage your heli. (b) Always practice to feel the controls first. (c) If any time your helicopter goes out of control, pull throttle (left joystick) low instantly to stop rotors. This will minimize the damage. (d) Quick change in speed or direction make you lose control. (e) Never raise height of heli beyond radio range, it will go uncontrolled. To know your radio range read the manual. For small heli it is 10-15 mtrs. (f) Never try to fly it in windy space. If indoor flying switch off fans. (g) While in flying if it reaches near wall, slow down the rotor to avoid hitting. (h) Always try to land by lowering throttle gradually instead dropping it. (a) Helicopter starts rotating right after takeoff: Ideally heli should stand at one place in air after takeoff. For this both upper and lower blade sets should rotate in direction opposite to each other at exactly same speed. If one set of blade spin slow then helicopter will start rotating in same direction to slower spinning blade set. • Check the blade for any damage. • Check shaft connection with blades. • Check shaft free rotation (by moving one blade set at a time). • Check connected gears for slippage. If any correct its alignment. Use small flat screw driver. (b) Upper of lower blades not spinning: A small motor engaged with gear to shaft, is used to power up blades. Separate motor for each set of blades. Check gears for any obstacle or slippage. (c) Helicopter not activating: Linking the remote with Helicopter. Refer para 4(e) and keep changing the channel position. (d) Charging problem: Refer para 3.